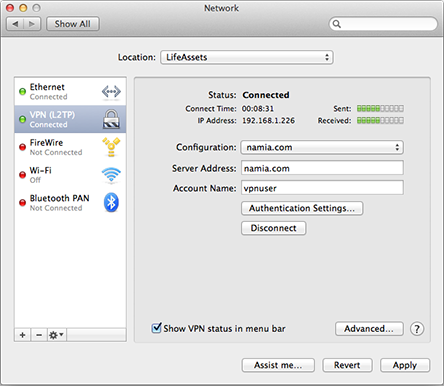 I used this “enabler” app to set up a VPN Server on Mac OS X Mavericks before I went to China, so I can access Facebook, etc, from my iPhone and MacBook Air, while I was on WIFI networks in Chengdu, Sichuan. 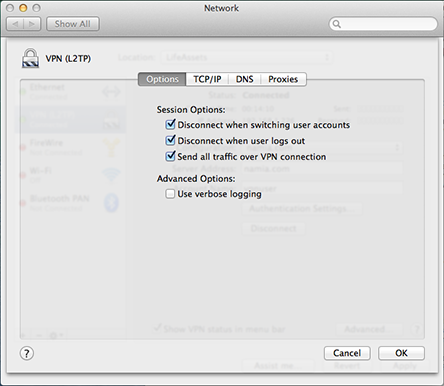 The iPhone or MacBook Air connects back to the VPN Server, which I’ll show how on the latter part of this page, and all interaction with the Internet from that point on goes through the local private network, on an encrypted channel, totally bypassing proxies and filters that may have been set up on public networks to deny access to sites like Twitter and Facebook. 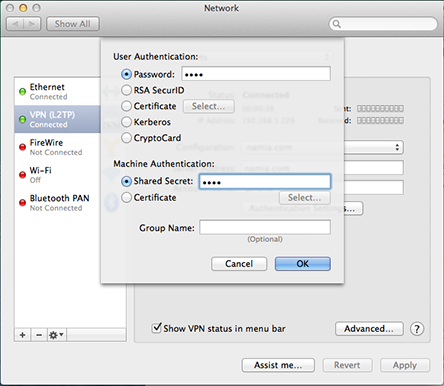 There is an VPN Server built into every plain Mac OS X machine, only it's not activated unless you know how to type in a lot of geeky commands and dive into a lot of configuration files. What VPN Enabler does is to do all that stuff for you in just three (OK, maybe four) steps and just one click. Step One. 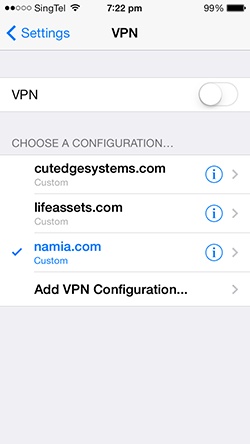 You only need to provide the Host Name for your VPN Server. Of course, this host name or domain name must be accessible from the Internet. Step Two. 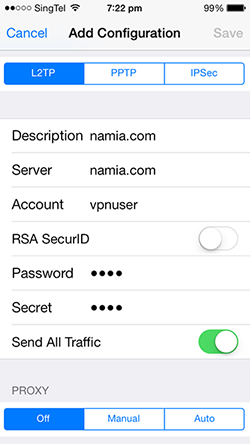 Enter a Shared Secret, which is just a word you need to enter into a VPN client, like Network Preferences on a client Mac or the VPN Connection Setup in iOS Preferences for the iPhone or iPad. Step Three. 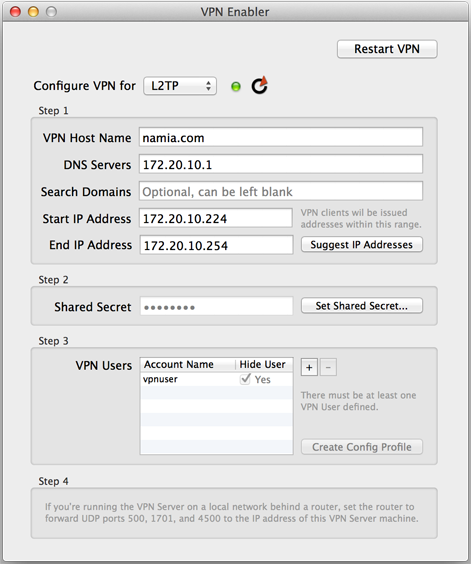 Set up at least one VPN user account on your server machine. Give it a name and a password. Both will also be given to the VPN Client. This is a bit more technical. If you’re running the VPN Server on a local network behind a router, you need to figure out how to set up the router to forward UDP ports 500, 1701 and 4500 to the local IP address of your VPN Server machine. 1.0 December 18th 2013. 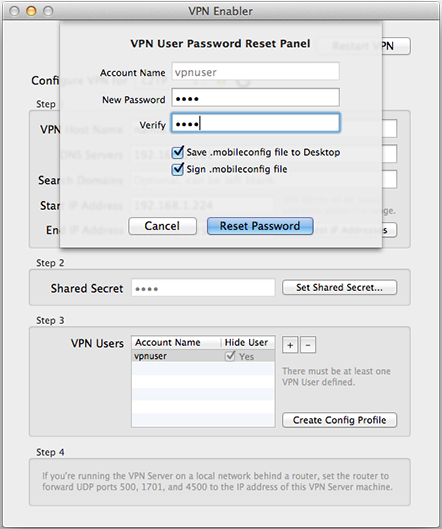 VPN Enabler for Mavericks released. 1.0.1 December 19th 2013. Added a “Suggest IP Addresses” button. 1.0.3 March 25th 2014. VPN Enabler can now save a signed mobileconfig profile, if the server it is running on has an SSL cert for the domain. It can also save the account password into the profile, if the profile is created while the user account is being newly created or having its password reset.